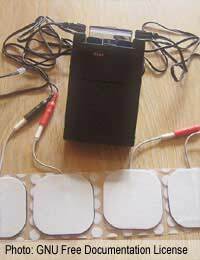 Home > Ask Our Experts > Is This Pain Due to Use of a TENS Machine? I have lower back pain and used a TENS machine for the first time on Friday for about five hours on and off. On the Saturday I was unable to get out of bed I could not move due to severe back pain but it was not just in my lower back but higher up. This has continued so far for two days (it's now Monday) although I am able to move about now so it is not as severe. Can you tell me if this is due to the TENS or is it just coincidental? On the whole, the chances of 'overdoing it' with the TENS machine are unlikely as many manufacturers and healthcare experts agree that it can't really be overused per se, however others are of the belief that it can indeed be left on too long or set to a frequency that is too high if you are not used to it.Really, when a person begins using a TENS machine, it should be applied with caution and left on for an hour or so until you are feeling more confident with the product and can more easily manage longer periods at a higher setting. Some people have also complained that they have sensitive red patches where the electrode pads were situated, but this may be more to do with an allergy to the material than anything else. There is a small chance that your additional pain was coincidental and that you would have experienced it regardless of using the TENS machine, but there is an equal possibility that the extra pain was caused as a result of prolonged use of the machine.My advice would be to try the machine again but proceed with more caution and do not leave it on for as long until you are a regular user. If you are unsure of whether you are using it correctly, please see your pain specialist or GP or ring the manufacturer's helpline for further advice and guidance on the matter. Good luck with finding a suitable form of relief for your back pain and let us know how you got on. Would a Chiropractor Help a Frozen Shoulder? Can Back Pain Be the Result of a Lack of Water? Is an Epidural Safe for a Kidney Transplant Patient? Would Another Pregnancy Worsen my Backpain? Can Exercise Help Mild Disk Bulge?